Running is one place dreaming happens for me. Not because I’m a good runner, mind you, but because it’s a place my mind is clear of all the to-dos and emotional clutter of life. Dogs don’t respond well to having rain dumped upon them. Or to being bombarded with half-inch hailstones. Or to running around a lake with no shelter when #1 or #2 occurs. And neither do eight-year-old daughters on bikes. Whether you’ve made a blunder like this or not, you’ve most certainly made a mistake or two in life. We all do. Some are minor and irritating. Others are devastating to us or those we love. In the midst of those debacles, how will we handle them? First, face them. Take responsibility for whatever you’ve done. Otherwise one mistake multiplies into two. It’s hard to own up to what we do, especially when we struggle with insecurity and guilt. But when we take responsibility for our choices and actions, we demonstrate wisdom and open the door to opportunities to reconnect with whomever we’ve adversely affected. Because we more quickly make things right, we don’t waste time floundering in denial. And even better, our honesty helps us avoid making the same mistakes again later on. Third, recognize the value of experience. A lot of mistakes occur in the process of trying something new or experimenting with a fresh approach to a familiar issue. Be courageous and decide you’re going to relish the experience of learning from your mistakes. Even if the outcome at the time was truly painful or even catastrophic, there are probably precious jewels of experience you’ve gained through the experience. As a friend recently pointed out, “Erasing [all our mistakes] would just leave a blank space—that’s not very interesting.” So treasure the results of your errors. And give yourself a little credit for trudging through the work it took to find the bright spot. This process contributes to making you who you are: a unique, beautiful creation God loves with all his Father heart. Fourth, move on. There’s nothing to gain from wallowing in our missteps except a loss of forward motion. And fearing our next mistake can paralyze us. As Elbert Hubbard put it, “The greatest mistake you can make in life is to be continually fearing you will make one.” Decide to walk through the mistakes. To learn from your goofs. To absorb the experience and move on. As we learn from mistakes, remember the invisible battle around us, and learn about the weaknesses that help shape our quirks and strengths, we’re opening the door to more of God’s wonderful in us and the unfolding of our God Sized Dreams! 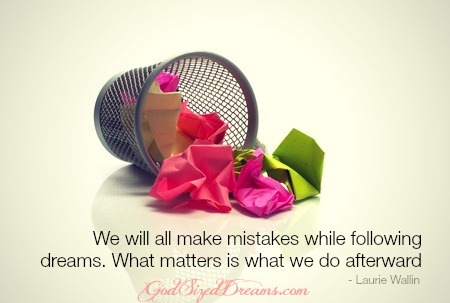 We would have to be perfect to never make mistakes and I don’t think any of us are perfect. I know I am not. Thanks for this encouraging post, had a few missteps myself this week and I am pushing through and past them but I still feel the sting, if you know what I mean. I’m so glad you came across the post just when you needed it. Hope you had a great Thanksgiving!